Considering the face value of this bill, the detail on the back is really amazing. 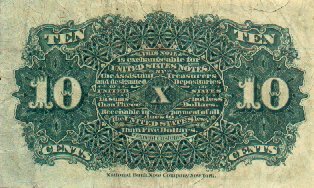 "This note is exchangeable for United States Notes by the assistant Treasurers and designated Depositaries of the United States in sums not less than Three Dollars. Receivable in payment of all the United States less than Five Dollars, except customs." The line along the center bottom of the note says: "National Bank Note Company New York."